In time I became very familiar with the incredible resource known as the Durland Standard Plate Number Catalog. First published in 1950 by the Sterling Stamp Company and initially edited by renowned philatelist Clarence B. Durland, the catalog of plate number and plate block information would be published annually by the Sterling Stamp Company until 1981. 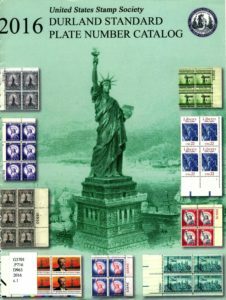 The publication of the catalog then changed hands in 1984 when the United States Stamp Society, then known as the Bureau Issues Association, took over production of the catalog as it has to this day. 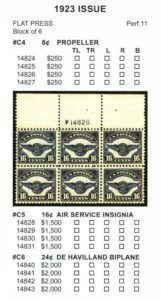 For collectors of plate blocks or researchers of plate numbers, the catalog is the most comprehensive resource for United States postage and revenue stamps, including tax-paid revenue stamps. Organized by Scott number, the catalog includes plate and value information for all regular, commemorative, air mail, postage due, parcel post registration, revenue, special delivery, certified mail, special handling, official, postal saving, U.S. possessions, newspaper and Confederate States issues. Plate block illustrations throughout the catalog are also included for identification and clarification purposes as well as many brief descriptions and diagrams of the known plates. Knowing a particular stamp’s plate numbers can be a very valuable bit of information to even the beginner collector, as it then enables the hobbyist to research the particular plate used for items in their collection. Published every three or four years since 1981, over the years supplements have also been published to include plate information in addition to the regular edition of the catalog. 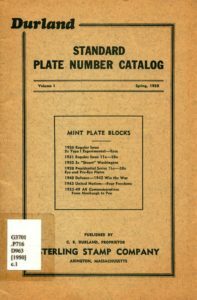 With the latest edition of the catalog published in 2016 the Durland Standard Plate Number Catalog remains the most comprehensive resource for the plate number collector and researcher. If you would like to borrow or make use of the Durland catalog feel free to contact the APRL at library@stamps.org.